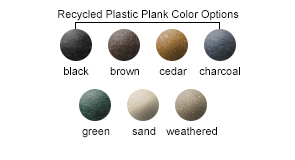 These cost saving, economy park benches are constructed of maintenance-free 100% recycled plastic 1-1/4" x 3" planks with a classic architectural form. Not susceptible to rotting or splinters as found with wooden products. All stainless steel fasteners included. Optional anchor kit provides added security to bolt the product to surfaces as a theft deterrent. Available in the colors shown below. 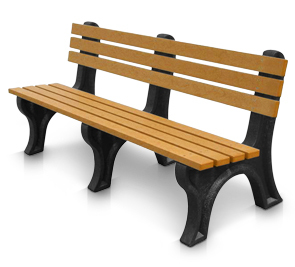 Personalize your bench with an engraved message or custom inlayed plaque. Square, rectangle, circle or oval shaped; plaque is supplied by customer and exact dimensions must be provided. At an additional charge, engraved lettering can be filled with a glossy resin inlay available in the resin color options as shown. A customer service representative will contact you to collect custom engraving order specifications. Custom engraved lettering may need to be resized for best fit. If this should be the case, it will be noted on your proof prior to approval. Signed approval is required to process order. Engraved benches are custom made and are non-returnable.